Project Title: Monitoring of thrips/Tomato spotted wilt virus (TSWV) in California peppers and the development of a regional IPM strategy for reducing the incidence and severity of TSWV. Western flower thrips (Frankliniella occidentalis) population densities and Tomato spotted wilt virus (TSWV) incidence in pepper fields in the Central Valley of California were monitored in 2015 to improve understanding of disease development and to allow development of an effective strategy for disease management. Field monitoring for thrips and TSWV was conducted in representative direct-seeded and transplanted fields in Yolo/Solano and San Joaquin/Contra Costa (SJC) counties as well as three pepper fields in the coastal area. In all monitored areas, the pepper fields were not germinated/transplanted until late-April and early May. Our results revealed relatively high populations of thrips (500-1700 thrips/yellow sticky card/two weeks) in pepper fields in all locations when monitoring was initiated in late-April. Populations in Yolo/Solano and SJC fields increased quickly during May, and remained high (>1500-6000 thrips/yellow sticky card/two weeks) in peppers through harvest. In contrast, thrips populations increased slowly in the coastal fields. Thrips populations fluctuated but remained at high populations throughout the season in all monitored fields, before dropping to low levels in October in all locations. The first detection of TSWV in pepper fields was in 21 May and 25 June in the Central Valley and the coastal area, respectively. In both locations, this was around when peppers were 3-6 inch tall and/or after transplanting. In 2015, TSWV was eventually detected in all 13 monitored fields. The overall incidence was relatively low (<1-3%) in early-planted pepper fields, similar to 2013 and 2014. The incidence of TSWV in late-planted or red pepper fields was higher (4-7%). Winter and spring weed surveys in monitored field locations revealed very low levels of TSWV (~3% infection). Additionally, fava bean cover crops and rough-seeded buttercup weeds (Ranunculus muricatus) were found in orchards and some plants were infected with TSWV. During the 2015 growing season, the website for the thrips phenology (degree-day) model accurately predicted the timing of adult thrips generations (~80% accuracy) in monitored pepper fields similar to 2013 and 2014. Thus, we believe that this model can be used as a reliable predictor of when thrips populations will begin to increase in pepper fields in the spring, and when it is best to apply thrips management strategies. We have developed a TSWV Risk Index (TRI), for predicting potential losses due to TSWV in pepper fields in California. Based on information gathered from each monitored field, the TRI for monitored fields in 2015 accurately predicted high, moderate or low risks, and these correlated well with observed TSWV incidences. Thus, the TRI showed good promise for predicting TSWV incidence in individual fields. An integrated pest management (IPM) strategy for thrips and TSWV management in pepper has been developed that should be effective, particularly if followed regionally. 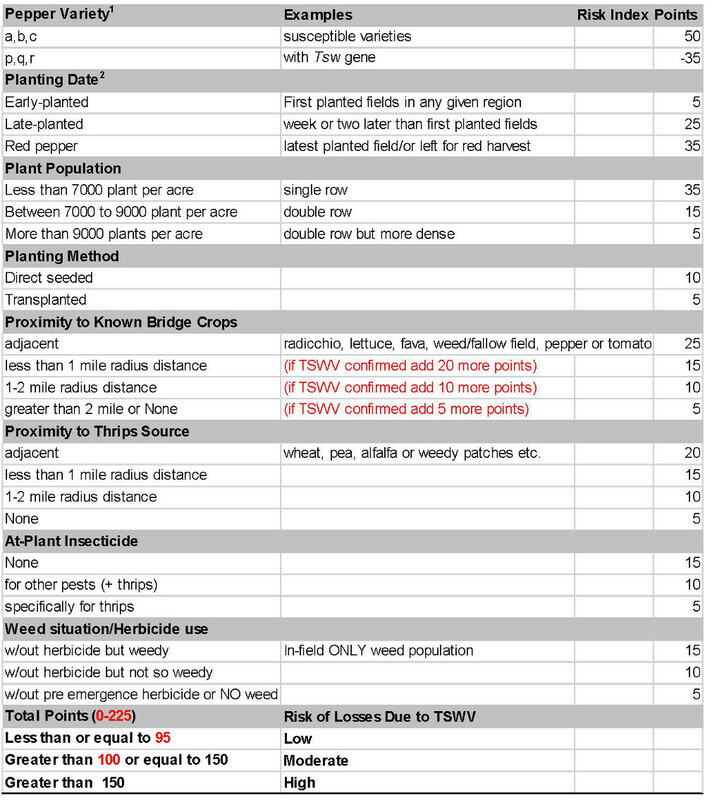 The objectives of this study were 1) to conduct surveys of selected Central Valley and coastal area pepper fields in 2015 to gain insight into when and from where thrips and TSWV enter into commercial fields; 2) to assess our degree-day model and TSWV risk index to predict thrips populations and TSWV in peppers, respectively; and 3) to develop an IPM strategy for thrips and TSWV in peppers grown in California. Thrips monitoring in representative fields. Table 1 lists the 13 pepper fields that were monitored for thrips and TSWV in 2015. Yellow sticky cards were placed at the four corners of each field, just above the canopy. The cards were changed biweekly beginning on 20 April and up to harvest (September-October). Population densities were estimated by counting thrips on yellow sticky cards in the laboratory with a dissecting microscope at 2X magnification. Thrips were identified to species at 40X magnification. TSWV incidence and detection. Percent TSWV incidence in pepper fields was determined by visually examining plants at the four locations in each field. At each location, all plants in 10 yards (meters) of each of 5 randomly selected rows (each separated by 5 rows) were examined for TSWV symptoms. An overall incidence of tomato spotted wilt (and other viruses) at each site of the field (four per field) was calculated (presented as number of infected plants per 100 row feet and % incidence). Disease incidence was assessed biweekly and selected plants tested with ImmunoStrips (AgDia) and RT-PCR (with N gene-specific primers) to confirm TSWV infection. For other pepper-infecting viruses, RT-PCR or PCR with virus-specific primers was used to confirm the infection in plants. Assessment of our degree-day model and TSWV risk index, which were developed and validated for processing tomatoes, to predict thrips populations and TSWV in peppers. The phenology model is based on a “degree day” model that utilizes the effects of weather (i.e., temperature) on thrips biology. Currently, this model generates the degree-day accumulations for each year from January 1 to October 31 in a map format (heat availability). We compared results of this model with actual thrips population data collected from monitored fields in San Joaquin/Contra Costa (SJC) and Yolo/Solano counties in 2015. To do this, weather stations were selected from these counties, and weather parameters were used to map climate conditions for each county. We then used this data and the phenology model to predict appearance of thrips generations from yellow sticky cards. The predicted data were compared with actual thrips population dynamics that were determined from yellow sticky cards from pepper fields surveyed in 2015. The previously developed TSWV risk index (TRI) for processing tomatoes of California was used to predict TSWV incidence in pepper fields in the Central Valley. To obtain a risk index value for a particular field, point values were assigned to critical components of pepper production practices according to their relative influence on spotted wilt incidence. For establishing the TRI we have emphasized factors that play important roles on disease development in pepper (i.e., pepper variety, planting time and location, proximity to the known TSWV and thrips sources, etc. ), based on results of our research. This TRI was applied to our monitored pepper fields to determine whether the values for pepper fields (low, moderate and high risk) accurately reflected TSWV incidence. Field monitoring: In 2015, field monitoring for thrips and TSWV was initiated in direct-seeded pepper fields on 20 April in Yolo/Solano County and in transplanted peppers in SJC on 16 April. To examine the situation in the coastal pepper production areas, we established a collaboration with UCCE Monterey County Farm Advisor Steve Koike in 2015. Here, we monitored three fields beginning 30 April in and around Hollister and Gilroy, CA. Overall thrips populations in early-planted pepper fields in Yolo/Solano and SJC, were relatively high (~500-1700 thrips/yellow sticky card/two weeks) in late-April. Populations increased substantially by early-May, and high thrips populations (>500-6000 thrips/yellow sticky card/two weeks) were observed throughout the season in all monitored fields (Fig. 1). In contrast, in coastal area fields the thrips populations increase was slower, and populations remained moderately high (500-1000 thrips/yellow sticky card/two weeks), and lower than those observed in Yolo/Solano and SJC (Fig. 1). 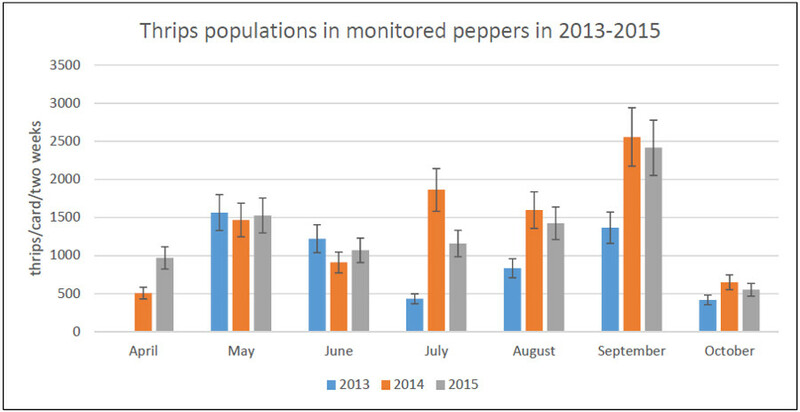 Nevertheless, in all monitored pepper fields, relatively high thrips populations were detected by early May, with populations fluctuating through September (Fig. 1). Thrips populations gradually declined through the end of October (Fig. 1). The monthly average thrips populations observed in 2015 were similar to those observed in 2013 and 2014 (Fig. 2). However, in 2014 and 2015 the late season (July-September) thrips populations appeared to be higher than those detected in 2013 (Fig. 2). Fluctuations observed in thrips populations during the 2014 and 2015 seasons probably indicated effects of insecticides, but these typically lasted only a short period of time. This was based on observations that, after a drop in thrips populations, a rapid increase was usually observed (Fig. 1). Therefore, we believe that if more precise timing of the thrips management in peppers were implemented based on thrips monitoring or our degree-day model, efficiency of the insecticide sprays could be more effective. All thrips captured in the pepper fields were identified as western flower thrips. Female thrips numbers were usually three-fold higher than males, a trend that we observed in processing tomato surveys in 2007-2014 in the Central Valley of California. Tomato spotted wilt virus (TSWV) incidence: TSWV appeared in all monitored fields including those that were established with TSWV resistant peppers (varieties with the Tsw gene). However, TSWV caused little or no economic losses in most fields, with the exception of some late-planted and/or red harvested fields in 2015. 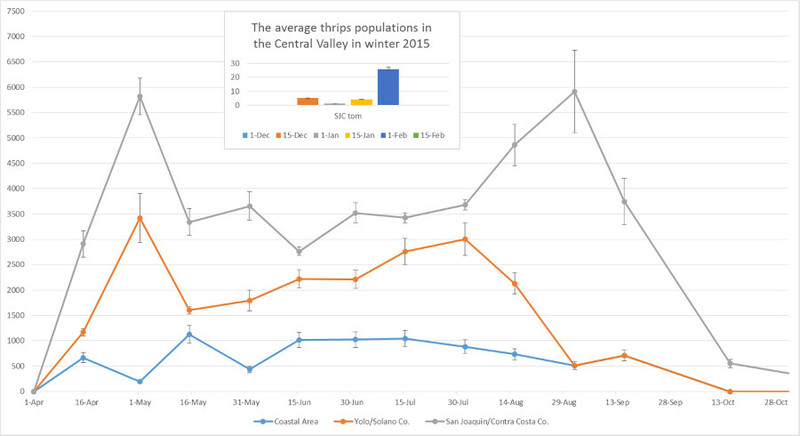 In 2015, TSWV first appeared in pepper fields on 21 May at the time when thrips populations were high in Yolo/Solano and SJC counties (Fig. 1). This was similar to 2013, but about a month later than in 2014 (data not shown). Nevertheless, first appearance of TSWV in all these years coincided with 1) the early vegetative stage of peppers (when plants were 3-6 inch tall or after transplanting) and 2) when high thrips populations (>500 thrips/yellow sticky card/two weeks) were present on peppers. This suggested a correlation between appearance of TSWV and increase in thrips populations. In coastal areas, TSWV first appeared in pepper fields on 25 June in Hollister and Gilroy, about a month later than Yolo/Solano counties, a relatively delayed appearance that probably was due to a slower thrips build-up. In 2015, TSWV was eventually detected in all 13 monitored fields, including those with TSWV- resistant pepper varieties, which indicates some small proportion of susceptible plants in resistant varieties. Overall TSWV incidences in early-planted monitored fields (as well as TSWV resistant peppers) remained very low (<1-3%) through harvest, similar to 2013 and 2014 (Table 1). Monitored early-planted pepper fields, which were not planted in close proximity to processing tomato fields, had low TSWV incidences (Table 1). In some late-planted green and red pepper fields monitored in 2015, TSWV incidences were higher (4-7%), especially in those parts of fields that were kept for red pepper harvest. In these cases, TSWV incidences gradually increased from 1% to 4%-7% by the end of the season (Table 1). The highest TSWV incidence (7%) in 2015 was observed in a late planted monitored red pepper field (fresh market) that was planted adjacent to a processing tomato field with TSWV symptoms in Gilroy (Table 1). In this field, pepper plants showed severe symptoms of TSWV infection, including wilting, necrosis on leaves and stems, shoot dieback, concentric rings on fruits, and malformed and bumpy fruits. However, even in this field, damage from TSWV appeared to cause minimal economic loss. However, the potential for loss due to TSWV exists. This trend is similar to that observed in 2013 and 2014, lower incidence of TSWV is early-planted compared with late-planted fields. Throughout the growing season in 2015, we surveyed selected additional pepper fields for TSWV in each county. Here, 3-5 randomly selected pepper fields in each county were surveyed in four corners of the field to assess disease incidence. The TSWV incidences in these fields were relatively low (0-4%), and similar to incidences observed in our monitored fields. In general, TSWV symptoms were found at one corner and/or edge of the fields, indicating presence of a nearby TSWV inoculum source, e.g., weedy orchard, tomatoes, etc. In these surveys, it was clear that pepper fields away from fields of TSWV-infected crops (e.g., processing tomato) had low TSWV incidence compared to fields that were adjacent to susceptible crops (data not shown). The sporadic (<1%) detection of TSWV in TSWV-resistant pepper fields in the Byron-Brentwood area of Contra Costa County and in Woodland in Yolo County indicated that these production areas may have had high TSWV disease pressure in 2015. Thus, it is possible that peppers without the Tsw-gene would have been affected substantially. Thus, we believe that use of TSWV resistant varieties may have prevented what could have been substantial economic losses in peppers. In 2014 and 2015, Alfalfa mosaic virus (AMV) was more widespread than TSWV (or any other disease) in monitored pepper fields, with incidences as high as 40% in some fields early in the season (Table 1). Interestingly, AMV did not seem to cause any visible damage to pepper fruits. Moreover, later in the season, most of the younger shoots that developed from these initially infected plants became symptomless and produced normal fruits. We believe that these pepper plants may be undergoing 'recovery' from AMV infection. This is a type of plant defense response (gene silencing) that specifically targets foreign nucleic acids (e.g., viruses). In 2015, we also became involved in virus disease problems in peppers in the Coachella Valley. We received pepper plants with unusual virus-like symptoms including bleaching, whitening of new growth, and general yellowing. Some pepper plants were stunted with small fruits and these were found to be infected with Beet curly top virus (BCTV), but at a low incidences (~1%). However, the rest of the plant samples tested negative for TSWV, AMV, BCTV and phytoplasma. We still do not know what was causing these virus-like symptoms in peppers in Coachella Valley. We suspect that these symptoms were nutritional and/or due to herbicide injury. In monitored fields in Yolo/Solano and SJC as well as coastal areas, BCTV and phytoplasma were also found in many fields but at low incidences <2% (Table 1). Key findings: TSWV outbreaks were correlated with increased thrips populations and field location (e.g., proximity to early-planted susceptible crops) and other viruses can also impact pepper production. Survey of potential hosts for TSWV: We continued our efforts to identify reservoir hosts of TSWV for peppers before, during and after the 2015 growing season. We focused our efforts around fields that were monitored in Yolo/Solano and SJC, and we collected numerous weeds, volunteers and other crops from these areas in the winter and spring before peppers were established. Bridge and cover crops: Fall crops (e.g., lettuce and radicchio) that are good bridge hosts for TSWV and thrips were found in coastal areas, but not in Yolo/Solano and SJC during fall/winter seasons in 2015. In coastal areas, four lettuce fields surveyed near monitored pepper fields had little (<1%) or no TSWV infection. A fava bean cover crop was found in a young almond orchard adjacent to a monitored direct-seeded pepper field in Solano County. Some fava beans and peas with necrotic leaves, stems and pods were collected and tested for TSWV with immunostrips and RT-PCR. Nine out of 16 symptomatic plants (56%) tested positive for TSWV (Table 2). The grower of this particular pepper field was informed and this infected cover crop was immediately disked by the grower prior to germination of peppers early in the growing season. Weeds: In 2015, weeds were collected from surveyed areas and tested for TSWV (Table 2). In all counties, weeds were abundant along roadsides and levees, and in fallow fields and some orchards. Most weeds collected before and during the pepper growing season were symptomless and tested negative for TSWV (with immunostrips and/or PCR). A small number of weeds including rough-seeded buttercup, and single plants of a chickweed, sowthistle, nightshade and Malva were infected with TSWV (Table 2). The overall incidence of TSWV infection in weeds was very low (~3%, 5 TSWV-positive weeds/174 tested) (Table 2). This was similar to results from previous years indicates that weeds in the Central Valley of California are not extensively infected with TSWV. In our 2015 surveys, particular attention was given to the newly identified weed host of TSWV, rough-seeded buttercup. We observed this weed in 4 of 7 walnut orchards that were surveyed in Yolo/Solano and SJC. Most of the buttercups in these orchards did not show obvious disease symptoms. However, a relatively small number (~1%) showed virus-like symptoms including some that showed symptoms of TSWV infection (chlorosis, bronzing and necrosis) and others that showed necrotic spots. Because buttercups showed symptoms upon infection with TSWV, only plants with symptoms (17 plants from 4 orchards) were tested for TSWV infection with immunostrips and PCR. Of these, only 1 plant tested positive for TSWV, and this plant came from a walnut orchard that was next to processing tomato fields that had TSWV outbreaks in 2013 and 2014. Buttercups with necrotic spots that were negative for TSWV infection most likely had chemical/abiotic damage. Key findings: Overall infection of weeds by TSWV was very low, but TSWV infection in one fava bean cover crop was found. In pepper fields monitored in 2015, the model predicted six thrips generations during the growing season (March-August). We reasoned that after emergence of each thrips generation there should be some degree of population increase in the fields. Thus, we looked at the generation times predicted by the model and compared these with actual population dynamics determined from yellow sticky card data to assess whether there was an increase in thrips populations after each generation and whether predicted and actual values were in agreement. In 2015, our degree-day model predicted generations of adult thrips in peppers with ~80% accuracy. Interestingly, for all years, the degree-day model targeted the 2nd thrips generations in early-planted peppers, and the 3rd generation in late-planted pepper fields for thrips control. However, in some cases, thrips generations predicted by the model were early or late, compared with actual thrips population counts, especially during the late-summer when thrips populations were very high (2,000-5,000 thrips/yellow sticky card/two weeks) in monitored peppers. However, these differences were in acceptable windows of time (± 2 days off), or occurred at the end of the growing season (August). Thus, these results are very promising and suggest this predictive model could be used to predict thrips build-up in pepper fields and for making thrips management decisions. Based on our extensive investigations of TSWV in processing tomatoes in California, we identified a number of factors that are important for TSWV development and management in processing tomatoes. These factors are tomato variety, planting time, planting density and method, proximity to known bridge crops and thrips sources, insecticide usage and weed situation. However, it was not clear if these same factors were important for TSWV development in peppers. Therefore, we initially evaluated the current TRI with monitored pepper fields in 2013-2015 by using the factors that were found to be important for the tomato-TSWV system. In fall 2015, we gathered most of the information about each monitored pepper field from growers. We calculated the risk index for each field based on factors listed in Table 3, and compared this with the known levels of TSWV in each field. Based on the current pepper TRI (Table 3), the monitored fields were assigned high, moderate and low risk (Table 1). When these TRI values were compared with the actual TSWV incidences in the 2015 growing season for each monitored field, we noticed a good correlation. The calculated TRI consistently identified risk categories for our monitored pepper fields (Table 1). It is worth mentioning here that, even though the monitored PS pepper field in Dixon was identified as a high risk field due to proximity to TSWV inoculum source (TSWV infected fava bean cover crop), this field had low TSWV incidence at harvest because of the measures taken to control and eliminate inoculum sources by growers early in the season. Although, many of the factors used in the current TRI for tomatoes are relevant to peppers, we feel that there may be specific factors unique to pepper (Table 3). Thus, more pepper surveys need to be conducted in order to assess the applicability of the current TRI for TSWV prediction in peppers. This will allow us to modify or change the factors and/or their proposed point values so that the TRI can be developed as a tool for helping growers determine if TSWV poses a risk in a given pepper field. We are now in the process of making the pepper TRI available to growers via a webpage and will propose to continue to fine-tune the current TRI and test it again in the 2016 growing season. Key findings: The thrips degree-day model accurately predicted appearance of thrips generations in pepper crops and has the potential to be a tool to predict timing of thrips control measures to reduce spread of TSWV. The pepper TRI can be used to predict TSWV threats in individual fields. Development of an IPM strategy for thrips and TSWV in peppers: By using the information generated in this project, we have developed the following IPM program for TSWV and thrips in peppers in the Central Valley of California. We believe that implementation of this program (all or in part) will help reduce TSWV to levels where economic losses can be substantially reduced, particularly if followed regionally. evaluate planting location/time of planting-this will involve determining proximity to potential inoculum sources during the time of planting (if possible avoid hot spots, planting near fields with tomato or susceptible bridge and cover crops and weedy orchards or late planting dates). plant TSWV resistant varieties (possessing the Tsw gene)-these are available but may not be necessary if other practices are followed. At least, resistant cultivars should be used in hot-spot areas or in late-planted and red pepper fields that will be established near early-planted pepper or tomato fields in which TSWV infections have already been identified. implement weed management-maintain weed control in and around pepper fields and especially in fallow fields and orchards, as some weeds are TSWV hosts, such as rough-seeded buttercup. If weeds are allowed to grow in fallow fields, they can amplify thrips and TSWV and serve as inoculum sources for peppers. monitor fields for thrips with yellow sticky cards or use the predictive phenology (degree-day) model to estimate when thrips populations begin to increase. manage thrips with insecticides at early stages of crop development and when thrips populations begin to increase (usually 2nd and/or 3rd thrips generations). rotate insecticides to minimize development of insecticide resistance in thrips. monitor fields for TSWV and remove infected plants early in development (<30 days old) and when percent infection is low (<5%). implement weed management-maintain effective weed control in and around pepper fields. Key finding: An IPM program for thrips and TSWV in pepper has been developed. Table 1. Pepper fields monitored in 2015: Locations, incidences of TSWV and other viruses, and TSWV Risk Index (TRI) values. **Part of this pepper field was kept for red pepper harvest and the final TSWV incidence is in parentheses. Figure.1 Average thrips counts per yellow sticky card in monitored pepper fields in 2015. Figure. 2. Average thrips counts per yellow sticky card in monitored pepper fields in all counties in 2013-2015. Table 2. Results of survey of weeds and cover crops in Yolo/Solano and San Joaquin Counties and coastal areas for TSWV infection in 2015. Plants were tested for TSWV by immunostrips and/or RT-PCR. Table 3. TSWV Risk Index (TRI) for peppers (2015).